When it comes to pregnancy, it’s key to eat the right things to ensure you and baby are happy and healthy. Pregnancy diets on the web have animal products as a staple part of the diet, but what if you’re vegetarian or vegan? We’ve put together a short guide to help you make the right vegetarian or vegan diet decisions. Can help decrease the risks of birth defects, boost brain development, better eating habits after birth and helps increase the odds of baby being born at a healthy weight. Can decrease the odds of some pregnancy complications such as gestational diabetes and preeclampsia. It can ease some symptoms such as morning sickness, balance emotions and improve odds of birth and labour timings. A good diet can also help a speedier recovery following the birth. Do I Eat for Two? It’s normal to gain weight during pregnancy and it’s actually healthy for you to put on a bit of weight. A healthy pregnancy includes fat storage, which is used as energy during labour as well as if you choose to breastfeed. Not gaining enough can increase the risks of complications during pregnancy. Gaining too much weight can also have the same effect and ‘eating for two’ is a myth. 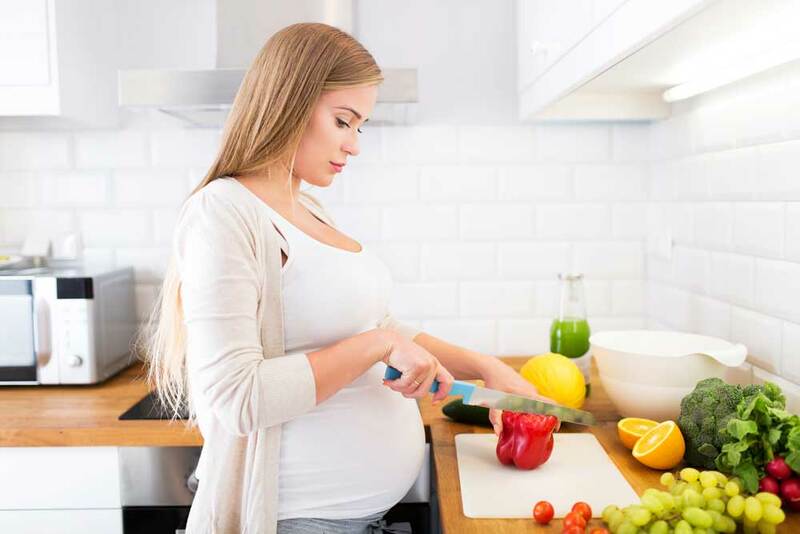 You should look to increase your calorie intake by around 300 calories daily during the second and 400-450 during your third trimester. A lady of average weight should gain 25 – 35 pounds, underweight ladies should gain 28 – 40 pounds and overweight ladies 15 – 25 pounds. See more here. Your vegetarian or vegan diet should include a good source of fibre, fats, protein, iron, calcium, folic acid and other vitamins. These include foods such as wholemeal bread, cooked cereal, rice or pasta. Fibre helps aid digestion and you should aim to eat 25-35 grams of fibre a day. Fats are good! But only if unsaturated – as saturated contain all the benefits but with less risk. Foods such as avocados, nuts, (fish if you’re pescetarian/only eat fish), olive oil and seeds. Calcium is essential for healthy bones and teeth. It can help baby grow a healthy heart, nerves, muscles and develop a normal heart rhythm. If you’re vegetarian, you can intake calcium with milk, cheese and other dairy products. If vegan, calcium can be found in a variety of foods such as calcium-set tofu, pulses, dark green leafy veg, unsweetened soya products, rice and oat drinks, plus sesame seeds and tahini. You should have around 1,000 milligrams (mg) a day before, during, and after pregnancy. Amino acids make up protein and these are the foundation of your body’s cells. 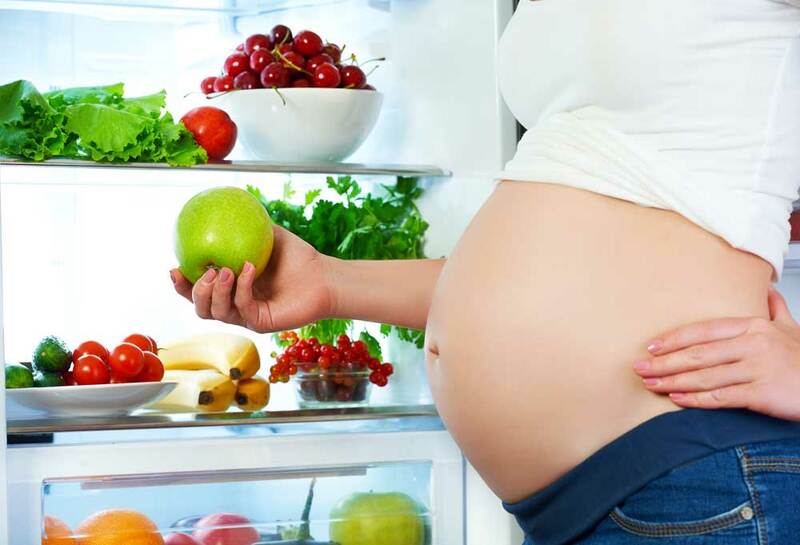 Protein is essential during pregnancy, especially in the second and third trimesters. This is when baby grows fastest and your body changes the most to accommodate little one. Protein can come from eggs, yogurt and cheese (vegetarian), as well as tofu, beans (kidney, white or black), chickpeas, peanut and almond butter and seeds. Expect to have 40-70 grams a day – this can depend on your weight, so check out the handy plate planner at the end of the article. You should take essential vitamins during pregnancy such as folic acid and vitamin D. Speak with your midwife or GP and they will recommend the exact supplements to take and when during your pregnancy. Some supplements such as vitamin D may contain animal substances, so check on these before you buy, and make sure you get the right dose as recommended by a healthcare professional. Whether you’re pregnant or not, it’s important to have a varied and balanced diet. When expecting, this can be daunting as you want to look after yourself as well as your little one. If you’re worried about a vegetarian or vegan diet, chat with your midwife or GP about the best food choices. You can also check out the NHS vegetarian and vegan guide here as well as advice on a healthy plate here.